I’ve admired Amanda Hesser for years now. Her writing in the NYTimes, her creation of Food52.com, and most recently her award winning The Essential New York Times Cookbook. 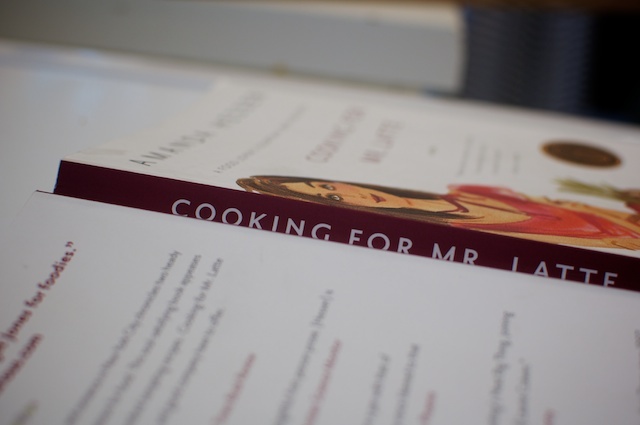 I finally read Cooking for Mr. Latte, her early tale of meeting her husband and the recipes that colored their courtship. A few things struck me . . . 1) Amanda is a great writer. 2) I know very little about food. I have never heard of most of the flavor combinations she talks about or the preparation methods her friends use for an easy dinner party. I tried to learn as much as I could. And then I came across her recipe for FRIED CHICKEN. Now we’re talking. Her mother’s oven-friend chicken. Easy. Crispy. I won’t kid myself that it’s healthy, but it’s definitely not deep fried. 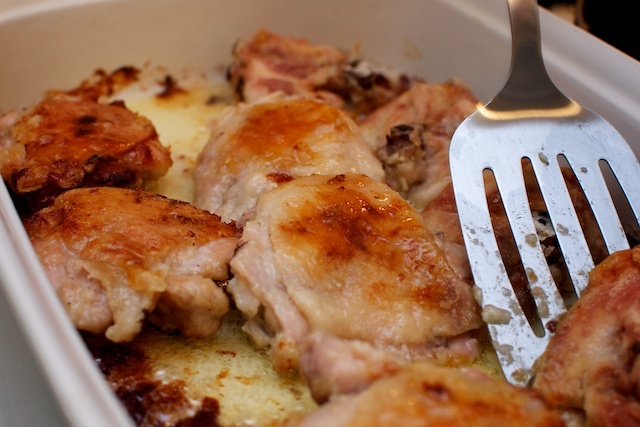 My favorite tip: soak the chicken thighs in salted ice-water all day. Apparently this helps the skin get crispier. I like it. In a large mixing bowl, combine salt with a little warm water and stir to dissolve salt. 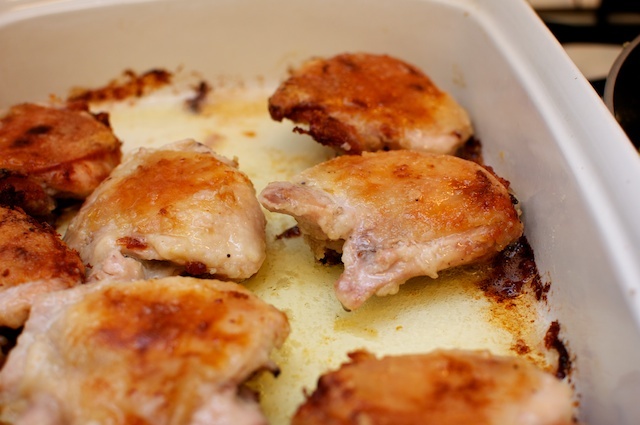 Remove the excess fat from the chicken thighs. Add the chicken to the bowl and cover with cold water and lots of ice cubes. Combine with hands until ice is surrounding chicken, and put in the fridge for at least 8 hours. Continue with the rest of the chicken, and lay in the roasting pan skin side down, on top of melted better. Oven-fry until the skin turns a deep brown and crispy, which can take about 1 hour. Once the skin is deep-brown, flip with a thin spatula and cook the other side for about 30 minutes. Top with fresh pepper and sea salt before serving. 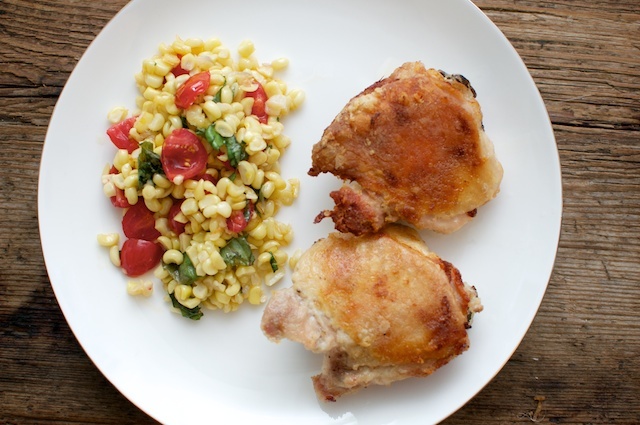 I served it with the corn tomato and basil side dish I posted last week.